Dallas Fair Park - 38. Livestock Pavilion and Arena. 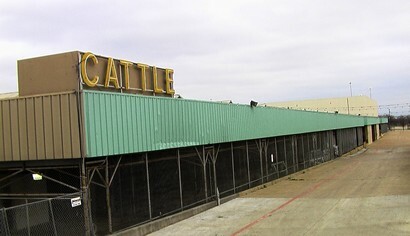 Located behind the Swine Building, the Livestock Pavilion was built in 1951. It began as a holding place for cattle and their owners, but expanded its role to include zebu, llamas, and longhorns. It also held cow milking demonstrations. For a period of time, an attraction called Big Tex's Barnyard allowed children to see farm products and animals. At the back of the building, there was a restaurant and a place for vendors to sell products designed specifically for farming. In 1959, the Livestock Arena was added next to the pavilion. It contains a huge dirt-covered ring divided in half by a walkway. On both sides of the ring, wooden bleachers allow visitors to enjoy the competitions. The future of the cavernous structure remains uncertain with the current construction of the livestock center. At the far end of the arena, there is a small building that holds animals when the pavilion is full.